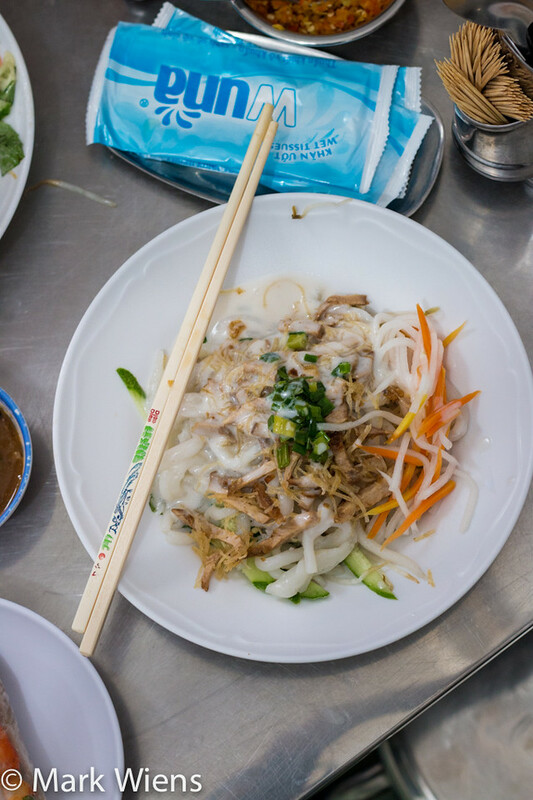 Banh tam bi is a southern Vietnamese dish of thick rice and tapioca noodles, tossed with herbs and pork, and drenched in thick coconut cream dressing. …But I had no idea what it was until I sat down and ordered myself a plate at a restaurant in Saigon known as Bánh Tằm Bì Đồng Tháp. The restaurant came as a recommendation from a YouTube video thanks to Yuyu Yuyu, when I asked where to eat when I was in Vietnam. 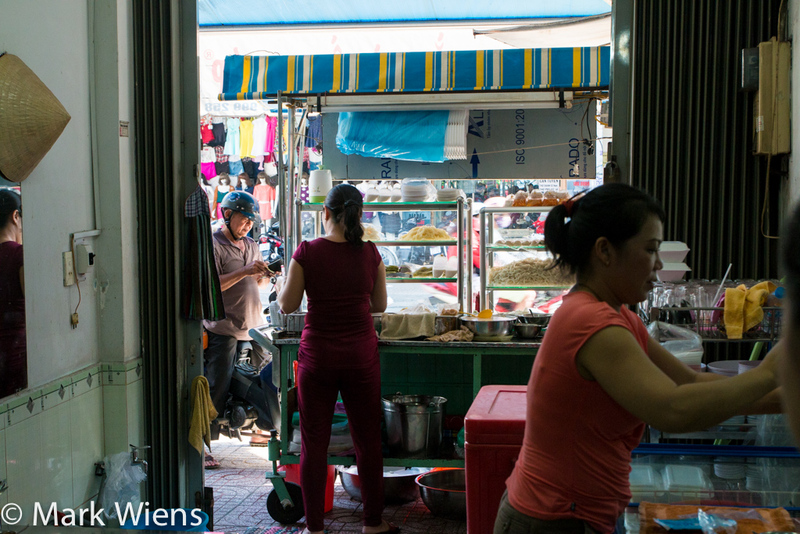 After spending much of the morning walking around the wonderful Binh Tay Market, in what is Saigon’s Chinatown (Cho Lon), I wasn’t too far away, and decided to try it out. 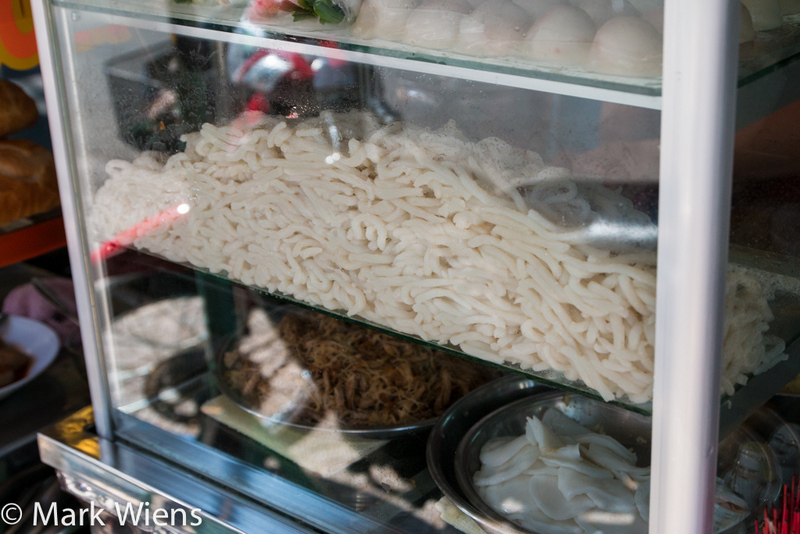 The first sign of a restaurant that serves banh tam bi in Vietnam is usually the food display cabinet showcasing a pile of the squiggly looking white noodles. You might also see some fresh herbs and vegetables, and notice a pan of coconut milk sauce sitting somewhere around. Here was the beautiful display of assorted ingredients at the restaurant, all patiently waiting to be dished out. See the pan of coconut milk in the left bottom side? Bánh Tằm Bì Đồng Tháp is a small and cosy restaurant, with low metal tables and stools. All the food, and the serving was at the front of the restaurant, as most restaurants are in Vietnam, and the tables were in the back (this makes it convenient to serve both sit-in and takeaway customers). To begin our meal, we ordered a couple of goi cuon, or fresh Vietnamese summer rolls. When I was in Vietnam I could not get enough of these. 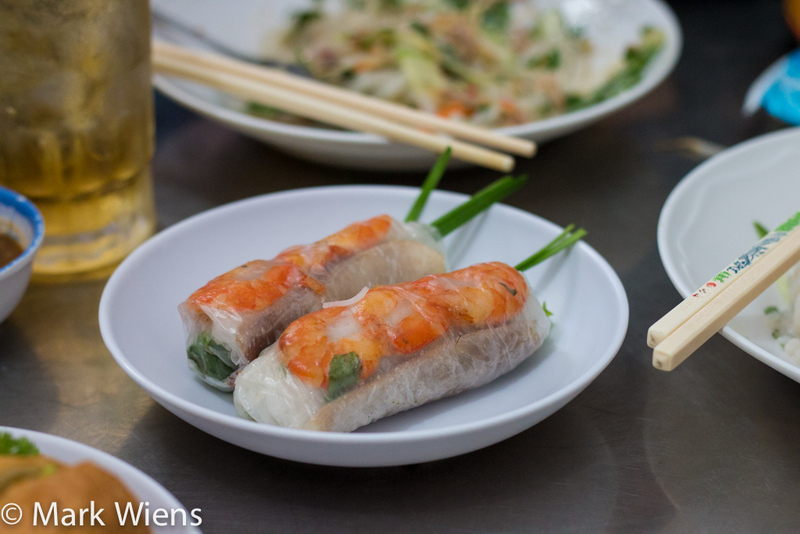 I love the combination of pork and shrimp, with soft fresh rice vermicelli noodles, herbs, and especially chives, all wrapped in a sticky rice paper sheet, and served with hoisin peanut sauce. They are always light and healthy tasting, and a make a great side dish to just about any other Vietnamese food you could eat. The goi cuon here were very good. Ying (my wife), wasn’t feeling like eating noodles the day we came here, so she opted to order banh mi. Her banh mi (bánh mì) was wonderful, and I believe it was filled with the same pork and pork skin mixture that came on top of my plate of banh tam bi. 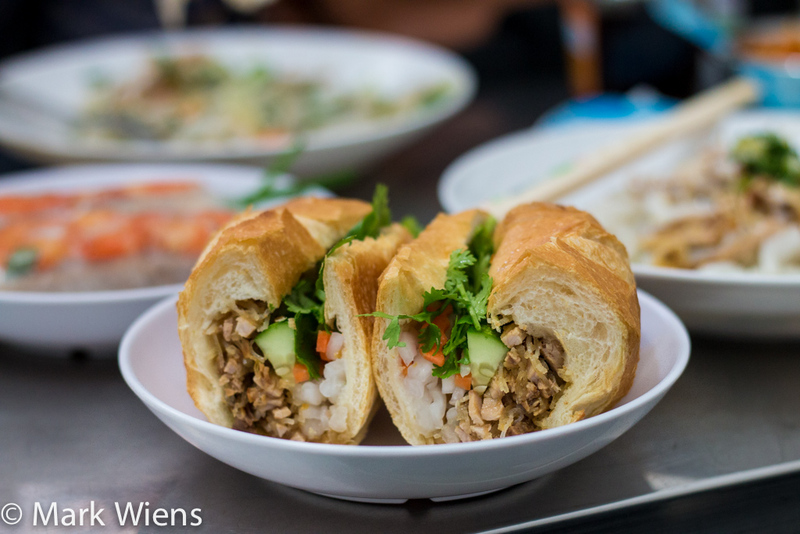 The sandwich also came with a generous scoop of Vietnamese daikon and carrot pickles, and a handful of fresh cilantro and cucumber stuffed inside. The baguette was crusty on the outside and fluffy on the inside. Banh mi is not the main dish served at Bánh Tằm Bì Đồng Tháp, but it’s always a good option in Vietnam. Ok, finally let’s move on to the dish this restaurant is most famous for, and the reason why I really came to eat here in the first place: bánh tằm bì. When I sat down and ordered, I really had no idea what I was about to get, other than knowing it would be some kind of dish made with the thick round noodles displayed in the front cabinet. My plate of banh tam bi (bánh tằm bì) began with a foundation of fresh Vietnamese vegetables and herbs. I’m probably going to miss explaining something that was added to my plate, but the main herbs and veggies I detected were cucumbers, mint, sweet basil, and a good amount of Vietnamese coriander (possibly my favorite flavor contribution to Vietnamese cuisine). 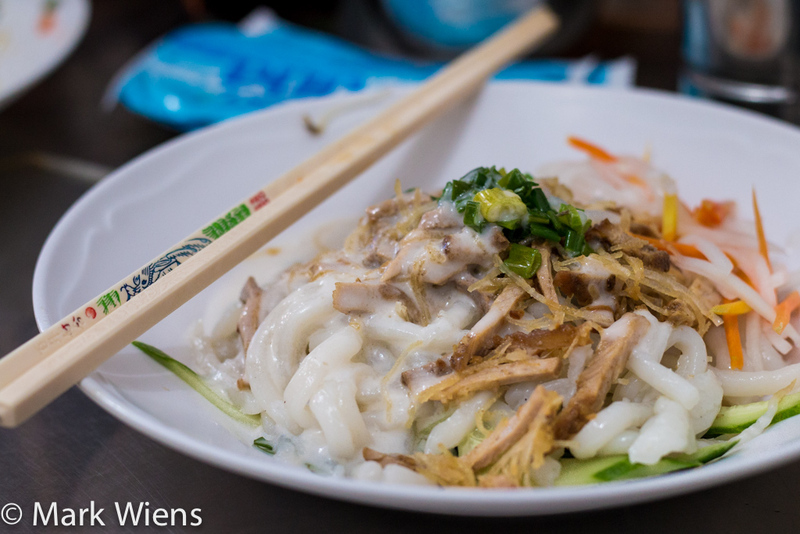 Next came a layer of the thick noodles, which I later found out are made of both rice flour and tapioca starch. The noodles were about the thickness of Japanese udon noodles, but they were much more sticky and even slightly gooey in texture. Then came a layer of lean pork sliced into thin strips, along with little one inch strands of what I think was pork skin. 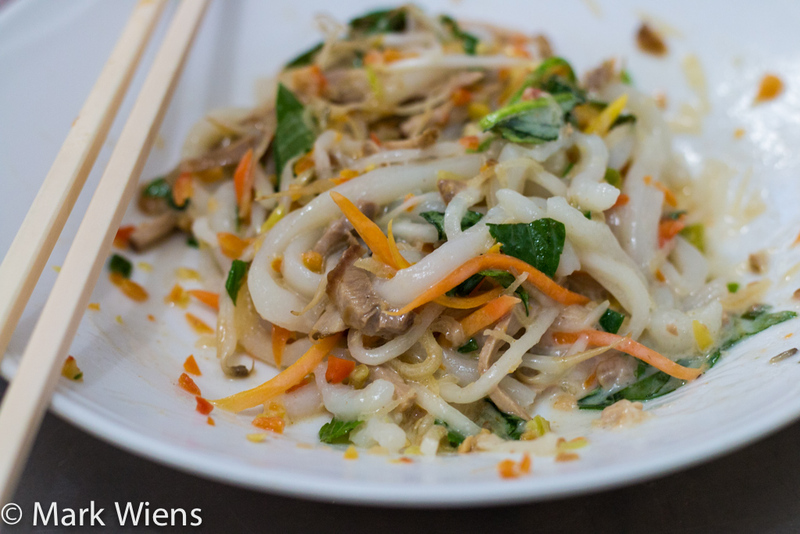 At first I thought they might be glass noodles from their appearance, but they definitely had that chewy pork skin texture and flavor. Finally, the banh tam bi was garnished with a spoon of daikon and carrot pickles, a ladle full of thick coconut cream gravy, and finally a scallion and oil topping to give the dish its final touch. After I was served, the kind owner of the restaurant instructed me to add some of the sauce, which was sitting on every table in a jar, to my noodles. I think it was a version of the omnipresent Vietnamese sweet fish sauce. There was also a bowl of fresh pounded chilies, which always comes as a welcome addition to anything that ever touches my plate. Since there were layers of different ingredients, the first thing I did was mix everything up, so the herbs mixed with the pork and the noodles and coconut cream. It had a wonderful freshness to it. The noodles were soft and sticky, the herbs provided so much freshness, and the coconut cream was sweet and rich. What really made the dish for me was the Vietnamese coriander, with its warm peppery, almost licorice like flavor. 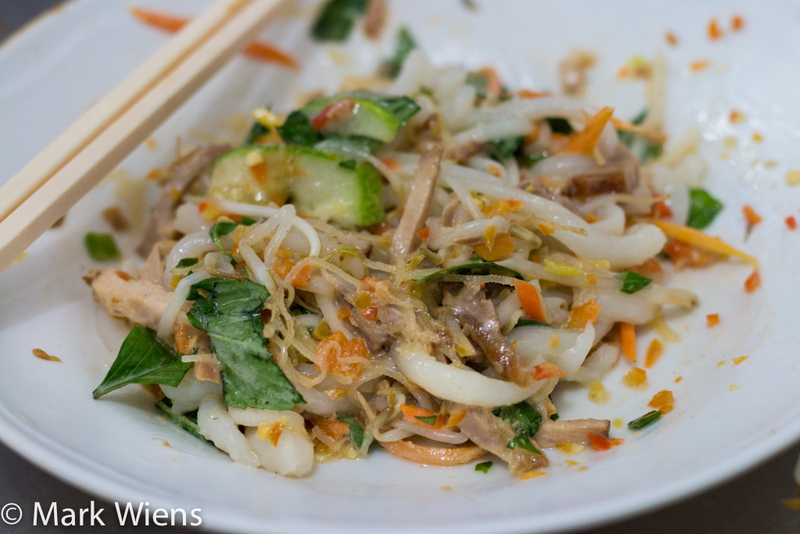 Overall, banh tam bi was a little on the sweet side for me – I think the coconut milk cream was a little extra sweetened – but nevertheless, it was still good. 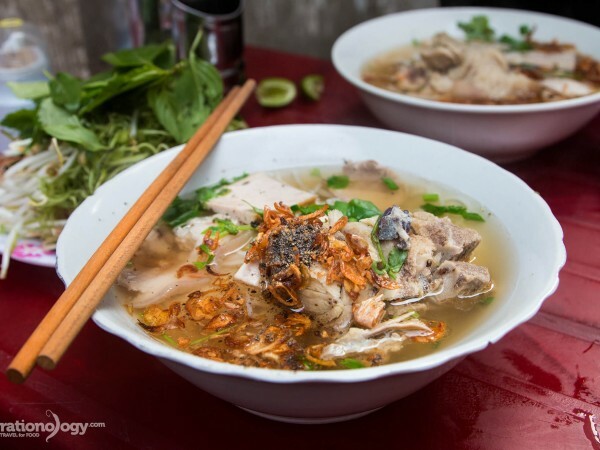 If you enjoy the flavor of coconut and the freshness of herbs and noodles, you’ll enjoy this southern Vietnamese favorite. At the restaurant they also serve a few different Vietnamese desserts as well. I didn’t try any here, so I’m not sure all that they had, but I’m sure they were good, as many people came to get a foam container full of takeaway sweets. 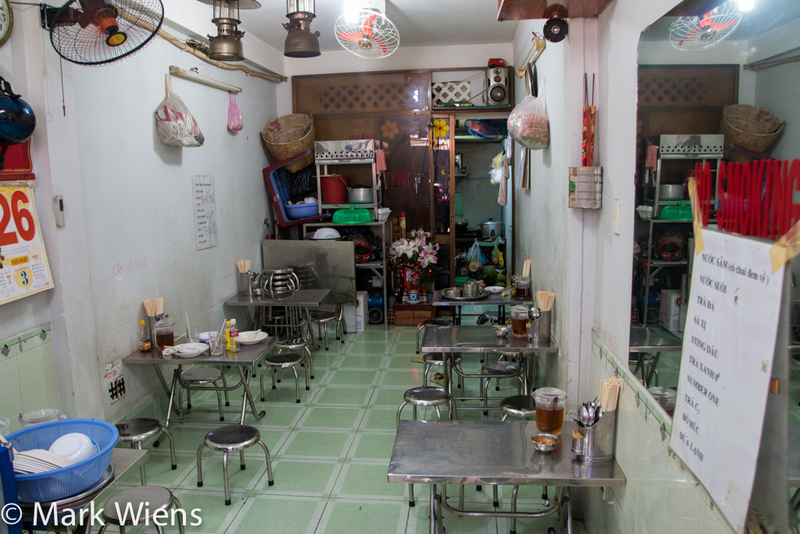 So if you eat here and want to try some sweets after your bowl of coconut noodles, don’t hesitate. Bánh Tằm Bì Đồng Tháp is a cosy little restaurant in Saigon, Vietnam, that mainly serves a southern Vietnamese noodle dish known as banh tam bi (bánh tằm bì). 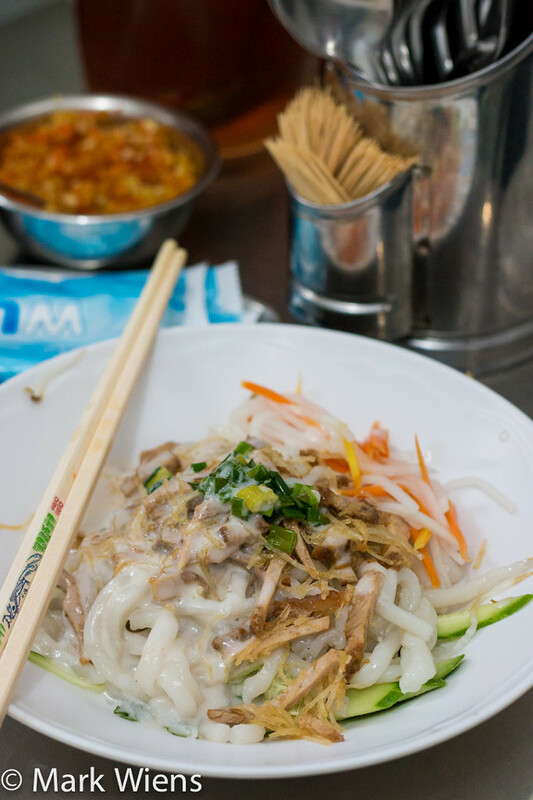 The dish includes thick sticky noodles paired with herbs, pork, and a sauce of thick sweet coconut cream. It was a little on the sweet side for me, but I did really enjoy the freshness of the dish, and the pureness of the coconut flavor, despite being sweet. 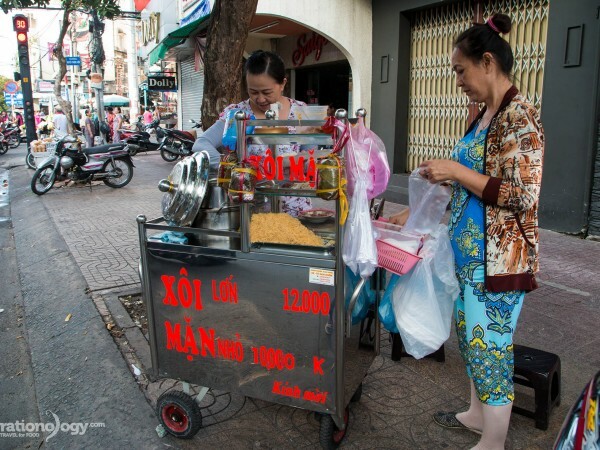 If you love the rich flavor of coconut milk, you’re going to enjoy banh tam bi (bánh tằm bì) in Vietnam. Thank you very much for recommending this restaurant to me. 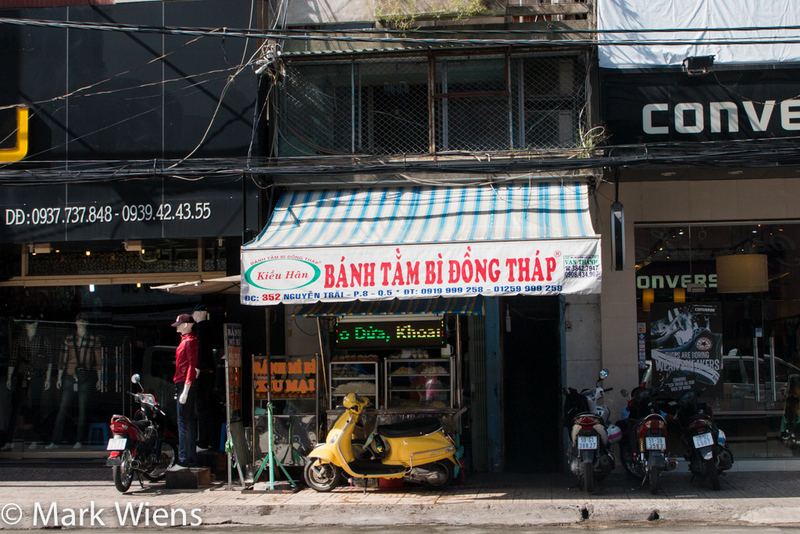 How to get there: Be sure to see the map below (click on #8), the restaurant is located on Nguyễn Trãi street, sort of in-between Cho Lon and Ben Thanh Market (though not close). You can either get there by your own transportation, or it’s about a 60,000 – 70,000 VND taxi ride from the Ben Thanh area. 26 comments. I'd love to hear from you! Probably one of the most delicious noodles I’ve ever tried!! Not hot, room temperature…outstanding! I forgot to tell you when I met you in Chatuchak!! We had a blast following your maps!! Hey Rodrigo, cool to hear that, thank you. It was great to meet you as well! 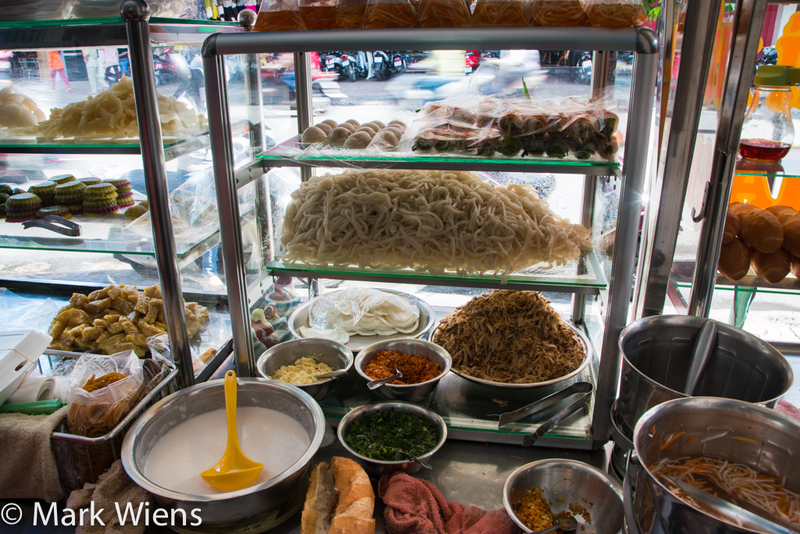 Thanks for creating Banh Tam Bi – Thick Noodles and Creamy Coconut Milk in Vietnam, actually love it. Your blog is just AMAZING. So happy to have found it! I am visiting Ho Chi Minh and your videos and reviews are very helpful. i just have a question: did eating in the streets never make you ill here? Hi Jiwon, great to hear from you, thank you very much. When I was in Vietnam, I never had a problem eating on the streets luckily. I think overall the conditions are pretty good. Hi Winny, thank you for reading, great to hear from you. Hope you can visit Vietnam in the future. 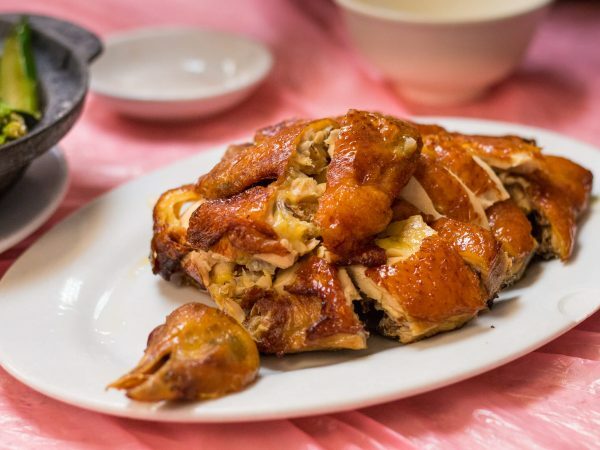 There are many beef dishes and chicken and seafood also. Hi Rosanne, thank you very much, great to hear from you. I visited China a few years ago, and I loved it. Right now, no plans to go back, but I would really love to. Are you from China? Thank for sharing all your tips. I also travel a lot in Vietnam and I still discovered some meal with you. I also want to know, which hôtel did you stay? Hi Kevin, you’re welcome, glad they are helpful. I stayed at Leblanc Saigon. its just amazing reading your blogs and website. i thank you for providing the readers like me a beautiful journey to different types of food. Wish you a happy new year and plenty of new food dishes …. Hi Sunil, you’re very welcome, thank you for the words of encouragement. Happy new year to you as well! You’re welcome Rob, glad you love the food too. Hope you can include Vietnam on your future travels. Ah this food looks way to good, now I am hungry. It’s all relevant to what culture you belong too. Eating insects is what most people in the world do. 🙂 Westerners typically do not eat from snout to tail because of our wealth. When you make less than $300, I can assure you that you will eat snout, blood, innards, heads…Everything. 🙂 They are good tasting too! Looks good! 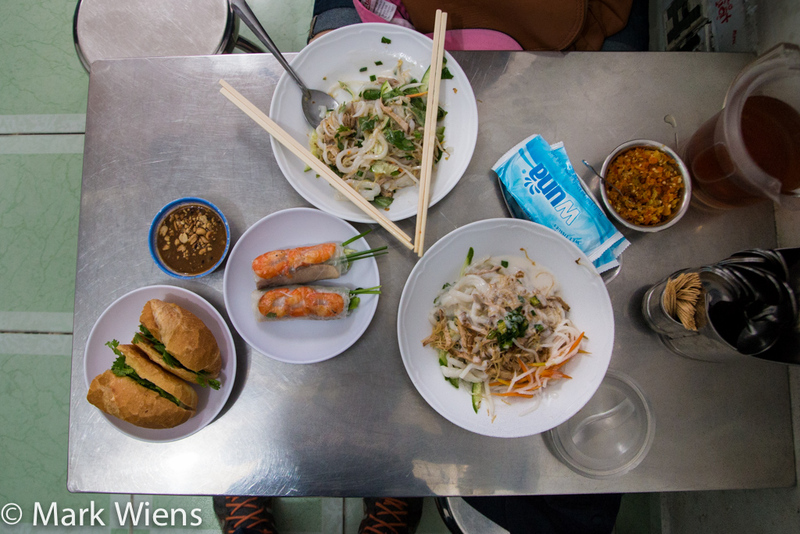 I can’t wait to travel to Saigon and get some amazing food. Thanks for the post. Will DEFINITELY be heading there for Vietnamese, that last dish especially looks incredible. Hey Luke, thanks, glad this dish looks good to you. Good news that you’ll be going to Vietnam, hope you enjoy this dish. Hi Mark. That dish reminds me of a sweet savoury coconut milk tapioca but instead of tapioca they use noodles. Looks pretty tasty though and I would definitely eat some!! I’ve been following your blog for only 5 months now but must say I’ve thoroughly enjoyed it and always look forward to checking out where you’ve been. I’ve always liked Thai food, but only since tuning into your site have I found myself running around all over the city on a regular basis looking for galangal, limes leaves, holy basil, Thai chilies, coconut milk, fish sauce etc etc. 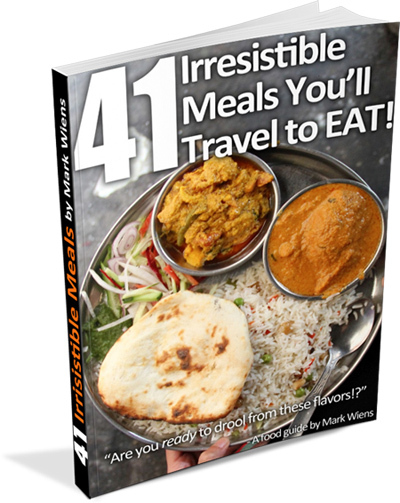 For that resurgence of my interest in Thai cuisine and for all the excellent and informative recipes, posts and videos you’ve made, I say “thank you Mark” and keep up the great work. All the very best to you and Ying in 2015!! Hi Neil, thank you very much for your encouraging words, and for following are blogs and videos, we really appreciate it. Glad that you’re making lots of Thai food. Happy new year to you!